Bichon Frises are happy, playful and intelligent companions. They are easy to train, good with people of all ages and other pets. They are cheerful, gentle, sensitive, outgoing and make wonderful addition to your family. This well-known breed originates from the Mediterranean, where it was a popular dog for Spanish sailors on trading expeditions dating back from 600 B.C. The Bichon Frise breed evolved as a mix of Barbet, lap dog and poodle; it became very popular with the noblemen and was considered a favourite of the French royal family. The American Kennel Club registered the Bichon Frise in 1973 and it remains a popular pet mainly for its hypoallergenic hair and its friendly disposition. The Bichon Frise is a naturally social dog and enjoys the company of others. They have a natural affinity for water and enjoys retrieving, and their exuberant nature makes them great pets for those wanting a dog that lifts their spirits. 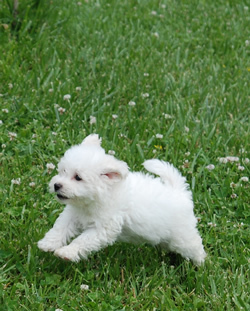 See our available Bichon Frise puppies -on left side click on Puppies Available.